Native American California Indian baskets were made extensively in the Western United states. California has some of the most expensive Indian baskets. Types of California Indian Baskets include: Kawaiisu Indian Baskets, Panamint Indian Baskets, Washo Indian Baskets, Tubatulabal Indian Baskets, Hupa Indian Baskets, Mission Indian Baskets, Mono Indian Baskets, Yokuts Indian Baskets,Tulare Indian Baskets, Washo Indian Baskets, Thompson River Indian Baskets. Famous California Indian Basket Weavers include Nellie Jamesion Washington,and Dat So La Lee, Washo. 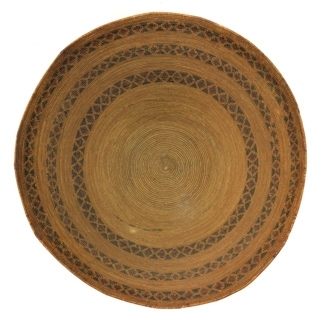 Baskets from this region may incorporate feathers, shell or glass beads. Esther Saheco - Panamint Basket with Original Tag, c. 1915-20, 3.25" x 4.75"
Hupa Cradleboard with Sunshade, c. 1900, 26.5" x 13" x 6"
Mission Polychrome Basket, c. 1900, 4.5" x 20.5" x 16.5"
Mono Friendship Basket, c. 1920, 4.25" x 7.5"
Panamint Basket, c. 1900-1910, 5" x 7"
Yokuts / Tulare Bottleneck Basket, c. 1900, 6.5" x 12"
Yokuts Basket with Geometric Band Design, c. 1880s, 8.75" x 17.25"
Yokuts Basket, c. 1890s, 10" x 19.5"
Yurok Winnowing Tray c. 1900s, 4.75" x 14.25"